we hope you're all doing well and are prepared for Christmas and the end of the year! We've been busy improving Episode 1 and adding features and are launching the big winter update, before logging off for the holidays. We're happy to announce that with today's update the German translation is available. You can change the language in the main menu. Note, that the audio is still English, but all texts are now available in German. The accessible mode for blind and visually impaired players is now available and can be activated with CTRL + V. We hope you enjoy the game! We love to make games more accessible for everyone and are learning with every step. We're happy and thankful to have your support and feedback, it helped a lot! On Steam, the update will download automatically. You'll have to re-download the DRM-free version. The update also contains minor tweaks and bug fixes. The Antibiotic achievement is now finally achievable! To celebrate the accessible version, between Dec 13th and Dec 26th, we are donating 10% of Code 7's revenue to blista. blista is a competence center for blind and visually-impaired people and at the same time an open and lively education and meeting site for all ages. Help us share this event and create awareness for accessibility in gaming. Spread the hashtag #gamingwithoutbarriers! Thank you all for your support and patience. Have a wonderful Christmas and a great start into the year! What would you do if you found yourself trapped on an eerie space station with nothing but a computer? 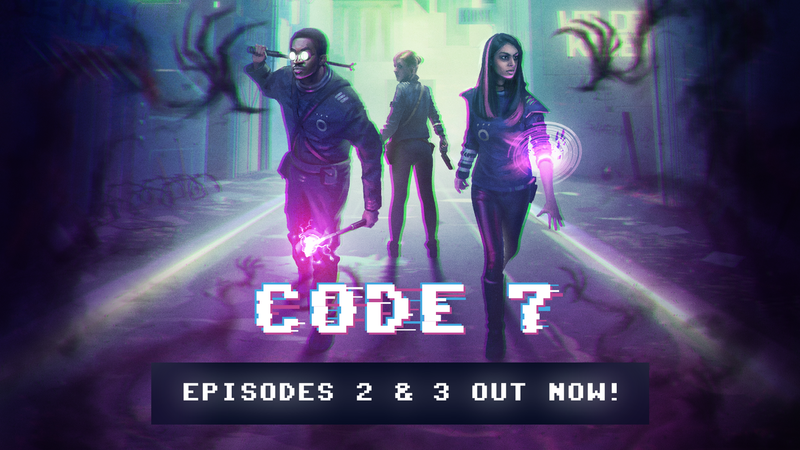 Episodes 2 & 3 are out!